Hiroshima is a medium-size city that is easy to explore to by public transport and on foot. Miyajima is a small island that can easily be explored on foot. Here are the details on the districts of Hiroshima and Miyajima. The Hiroshima Station Area is where you will arrive in the city. It also functions as one of the city’s downtown areas. You’ll find some of the biggest hotels and shops here, as well as plenty of great restaurants. Outside the south side of Hiroshima Station you’ll find taxi ranks, the main bus stops and the street tram (which is the best way down to the Peace Memorial Park Area). About 1km southwest of Hiroshima Station, on the far side of the Kyobashi-gawa River, you will find Downtown Hiroshima, which includes the Hon-dori and Hatchobori areas. This is an area of wide avenues and covered shopping arcades. It’s filled with shops, restaurants and hotels. This is a very good area to be based in Hiroshima since it’s within easy walking distance of the Peace Memorial Park Area. Located on an island just across a bridge to the west of Downtown Hiroshima is the Peace Memorial Park Area. 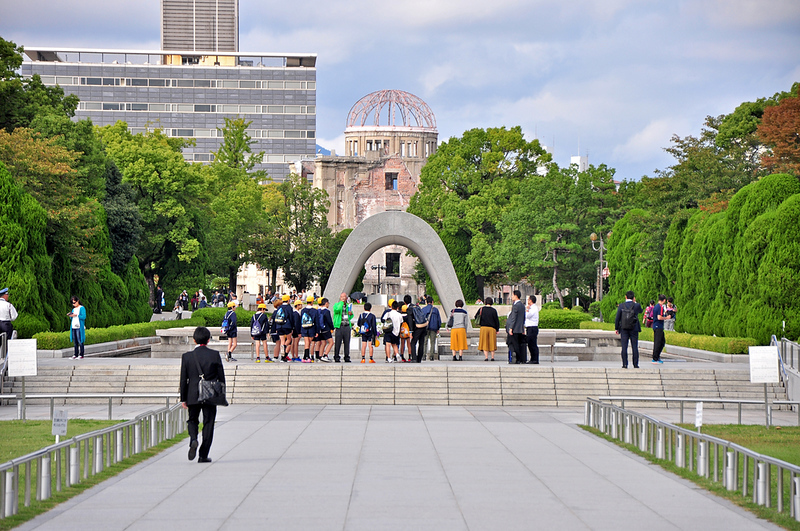 As the name suggests, this is a park-like area around which you will find the various sights that memorialize the 1945 atomic bombing of the city. Here is where you’ll find the Hiroshima Peace Memorial Museum. Also known as Itsukushima, Miyajima is an island about 16km/10mi kilometers southwest of Hiroshima. Almost all the main sights are clustered in the village near the ferry docks. A few other sights are clustered around Mt. Misen, which is located about 2km/1.2mi southwest of the village.